BESTEK mount holder is sturdy and stylish and can be easily mounted on a wall, under the kitchen cabinet or used as a countertop stand and seamlessly integrate your tablet into your space for you to conveniently access apps or watch videos. 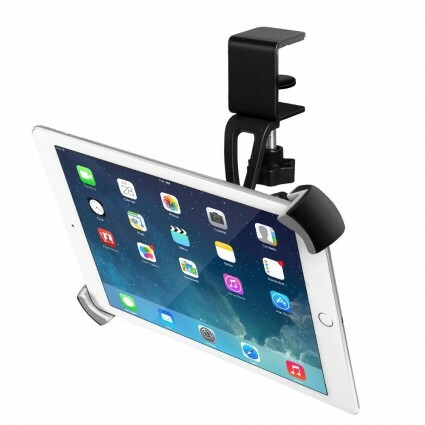 Stay connected and enjoy more fun from your tablet with this tablet mount holder. The tablet holder is primarily designed for most 9.5-14.5 inches tablets, fits apple iPad Pro, iPad Air, iPad Air 2, iPad 2, iPad 4 NeuTab, Samsung Galaxy Tab E, Samsung Galaxy Tab A, Samsung Galaxy Tab Pro, Dragon Touch X10, Kindle fire HD 10 tablet and other compatible devices. Anti-slip rubber bumpers inside the clamp keeps mounting efficient and the rubber padding inside can protect your tablets from scratching. And a well cushioned pad protects the surface it attached, anti-scratch. A ball joint of 360 degree rotation, you can adjust the tablet to an optimal angle. An adjustable arm can fit your device perfectly, enjoying watching movies, playing games and listening music. The clamp is made from Eco friendly abs material, durable and sturdy. The clamp functions smoothly onto the desk and table of home or office. It is easy and fast to mount it onto the desk, no special tools required. Note: The metal clip range is 1mm-40mm, please make sure installation position is within the range.